* INDIA (RLPB 276), where Hindu nationalist agitators are inciting persecution of Christians and where those who do persecute Christians are guaranteed impunity. This is an extremely dangerous situation. Pray for the Church in India. * LEBANON (RLPB 277), where Syrian al-Nusra and IS jihadists, who have heavily infiltrated north Lebanon's Syrian refugee camps, are committing acts of terrorism and threatening Christians in Tripoli and in the Bekaa Valley. During a clash with the Lebanese Army in Arsal, the jihadists took 42 Lebanese security personnel hostage before demanding the release of some 400 Islamists from Lebanese prisons. IS has since beheaded two of the captives (a Sunni and then a Shia), sending tensions soaring and generating a movement against Syrian refugees in Lebanon. Lebanese and refugee Christians are deeply anxious. UPDATE: On 19 September Al-Nusra posted footage of their execution of a captive soldier, along with their threat to execute one soldier after another if demands are not met. Police have arrested two local Lebanese IS supporters over the threatening pro-ISIS graffiti that appeared on churches in Tripoli. * SAUDI ARABIA (RLPB 278), where 27 mostly Asian expatriate believers have been arrested for gathering in a private home for prayer and worship; also a Saudi refugee convert named Khalid Alzahrani was abducted from his home in Christchurch, New Zealand, and forcibly repatriated to Saudi Arabia where the penalty for apostasy is death. Three trends are present in Iran today: Iran is ascendant in the Middle East; Iranians are abandoning Islam in unprecedented numbers; the leadership is preparing for transition. [Supreme Leader Ayatollah Khamenei has cancer and, according to some sources, it is advanced and terminal.] Mix these trends and you get escalating repression. This month, an Iranian blogger was sentenced to death for 'insulting the prophet'. In May six young Iranians were arrested in Tehran after a truly delightful film clip they made of themselves harmlessly dancing to Pharrell Williams' song 'Happy' went viral. On 17 September the youths were each sentenced to six months' jail and 91 lashes, suspended for three years (i.e. they will receive their punishment only if they 're-offend' in the next three years). As they have not been banned from leaving the country the regime doubtless hopes they will leave, taking their 'offensive' happiness with them! Persians who are openly Christian are also being driven out of Iran using exactly the same tactic of inculcating fear and despair through intimidation and threat. Hoping to counter the trend of God moving powerfully amongst Persians both in and outside Iran, the regime is ratcheting up the pressure on pastors and evangelists. As noted in RLPB 275 (27 Aug), two pastors, Saeed Abedini (34, a US citizen) and Farshid Fathi (35), have now been moved from Evin Prison (which houses political prisoners) to the maximum security Rajaei-Shahri prison which houses the state's most violent criminals. This move deliberately endangers the lives of these pastors and doubtless terrifies others seeking to witness for Christ in Iran. Furthermore, the regime recently upgraded the charges against Behnam Irani (43), pastor of a 300-member Church of Iran in Karaj city. Already serving a six-year sentence for crimes against national security (witnessing to Muslims), Irani now stands accused of 'spreading corruption on the earth' -- a capital offence. His family has not had any contact with him since 25 August. Please pray for the Church in Iran and especially for Iran's Christian prisoners. Central African Republic (CAR) remains wracked with insecurity, for, as noted in RLPB 271 (30 July), the ceasefire signed is meaningless and unenforceable. On 6 September Fulani herdsmen (Muslims) supported by Seleka (Islamic) rebels attacked Ngakogbo, near Bambari in central CAR. In their clash with the anti-balaka (a non-Muslim, village defence force), which lasted all through the next day, four Fulani Muslims were killed. 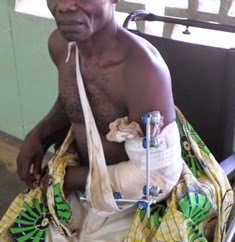 On 8 September Seleka retaliated to avenge the deaths of the Fulani attackers. Armed with rifles and machetes, they descended on Ngakogbo and killed more than 100 citizens. Three Seleka militants broke into the Elim Church, rounded up the small group present and started shooting. Pastor Pierre Bapteme (46), a deacon and three choir members were all shot dead, while Pastor Lucien Imbi of the Apostolic Church survived by pretending to be dead after being shot in the arm. On 15 September the UN assumed responsibility for the 'peace-keeping' operation. However, only 6000 of the expected 12000 troops have so far been deployed. Please pray. Boko Haram (BH) appears to be following the lead of IS in Syria and Iraq. Instead of committing acts of spectacular terrorism aimed at extracting concessions from the Nigerian government, BH appears to be focusing on seizing territory and has already declared a caliphate [see RLPB 275 (25 Aug)]. Maiduguri (the Borno capital) – which already hosts some 58,000 internally displaced persons (IDPs) – is encircled, leading to grave concerns that, with the farming cycle disrupted, hunger will set in. President of the Church of the Brethren in Nigeria, Rev Samuel Dali, told World Watch Monitor (16 September) that Christians -- many of whom have lost everything -- are 'on the run'. He wonders how three states under emergency law -- Borno, Yobe and Adamawa -- could be so close to being taken over by jihadists. Dr Stephen Davis (63), known as a devout Christian Australian, has worked as an advisor to the past two Nigerian presidents. He has also served as an 'amateur peacemaker'. Davis has gathered the names of senior Nigerian military and political opposition figures who he claims are funding and facilitating the BH insurgency, hoping to discredit Prime Minister Goodluck Jonathan ahead of the 2015 elections. As Davis notes, their venture has spun right out of control. Meanwhile, ethnic Fulani Muslims continue to expand their territory through jihad against Christian towns and villages. This month three villages in Plateau State were attacked by well-armed Fulani who killed, looted and burnt to shouts of Allahu Akbar (Allah is greater). Pray for Nigeria, especially for the imperilled Church in Northern Nigeria. On 22 September 2013 two suicide bombers entered the grounds of All Saints Church in Peshawar, the capital of Pakistan's Khyber Pakhtunkhwa (formerly known as North West Frontier Province). They mingled amongst some 600 worshippers enjoying fellowship after the service and then detonated their explosive vests, killing 87 believers and injuring 170. A year on, this is still a deeply traumatised community. Gill (left) has received many death threats. Early this month, leaflets in the local Pashto and Dari languages started appearing in Peshawar and in the surrounding Afghan refugee camps, calling for Muslims to rise up, join IS and establish a caliphate covering Afghanistan and Pakistan. Christian lawyer Sardar Mushtaq Gill warns that the situation is extremely dangerous and many Christians are expressing great anxiety about the future. 'I reassured them,' he told Fides (22 September), 'saying that God is with us and provides for his children.' However, Gill says, 'We cannot ignore the growing threat of IS in Pakistan.' Please pray! The House of Saud portrays itself as a champion of inter-faith dialogue and ally of the West. Yet behind the facade, this same regime sponsors, through its religious establishment, the global dissemination of virulent Salafi / Wahhabi (fundamentalist and puritanical) Islam, i.e. the version of Islam behind al-Qaeda and IS. [These groups diverge over tactics, not goals.] While Saudi Arabia sponsors Islamic jihad and Islamisation globally, it keeps its own state in lock-down with zero tolerance for any challenge, political or religious. Both domestic and foreign policy revolve around preserving the regime which supplies oil to the West and petro-dollars to Islam. There is no religious freedom – not for Saudis, not for poor expatriates and not even for exiles. Virtually all Saudi Arabia's oil infrastructure is located in the kingdom's Eastern Province, on the shores of the Persian Gulf. Tensions are always high there as Eastern Province is home not only to the kingdom's long-persecuted Shi'ite minority (who comprise a restive majority in Eastern Province), but to many thousands of expatriate workers, many of whom are Christians. Whilst British, European and American expatriates may gather for worship in chapels inside embassies and military bases, impoverished and abused Christian labourers from Africa and Asia have nowhere to gather for prayer, worship and Bible study except in secret house fellowships, even though such gatherings are illegal. On 5 September religious police from the Commission for the Promotion of Virtue and Prevention of Vice raided a house in the Aziziyah neighbourhood of Khafji in Eastern Province, arresting 27 mostly Asian believers, including women and children. Bibles and other belongings were confiscated. The Saudi Gazette posted the news on its Facebook page, triggering a very interesting debate, with many Saudis declaring it ridiculous and hypocritical that Saudi Arabia should deny expatriates the freedom to worship. It is common for Christians in Saudi prisons to receive very harsh treatment from Muslim guards and interrogators who know they can brutalise poor despised Filipino, Indian and Eritrean Christians with impunity. American religious liberty champion Rep. Frank Wolf (R-Va) has vowed to press the US ambassador in Riyadh and the State Department to assist the arrested Christians. Please pray. Saudi national Khalid Muidh Alzahrani arrived in Christchurch, New Zealand, some five years ago on a Saudi Government scholarship to study English. 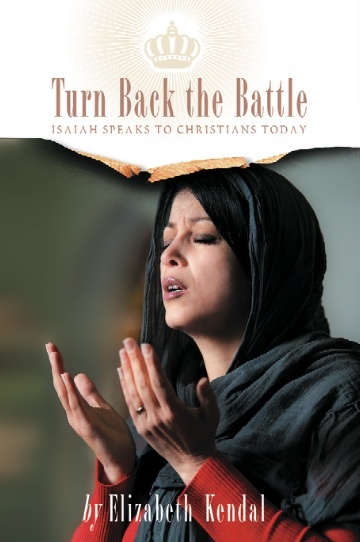 Some time after the Christchurch earthquake Alzahrani converted to Christianity. Because apostasy (leaving/rejecting Islam) is punishable by death in Saudi Arabia, Alzahrani (42) applied for asylum in New Zealand. Whilst his application for refugee status was successful, the backlash was fierce. It is well known that Saudi agents are inserted into the student community to ensure no Saudi national brings 'shame' on the kingdom. When a convert is discovered, pressure is first applied to the convert's family, who are tasked with the responsibility of fixing the problem. If that fails then the regime applies pressure on the convert, contacting them directly and threatening to hurt their family back in Saudi Arabia. The regime is even known to use Interpol to track down converts and forcibly repatriate them as criminals. When Khalid Alzahrani (now known as Daniel) started getting threatening messages from his brother in Saudi Arabia, he knew the situation was becoming dangerous. He continued to receive threats until 31 July, when two men arrived at his council flat in Christchurch and took him away. None of his friends have heard anything from him since. Saudi ambassador, Ahmen Al-Jojani, told the Sunday Star Times that the Saudi consulate provided Alzahrani with a ticket to Saudi Arabia after he 'insisted' on returning to visit his mother. The fact that Alzahrani did not pack, and left a half-eaten meal on the table, indicates otherwise. Interpol has confirmed that Alzahrani has arrived back in Saudi Arabia. Alzahrani is not the only Saudi convert to Christianity to disappear from New Zealand. In May 2013 a Saudi convert seeking asylum in New Zealand was taken from his home in Auckland by three men -- his brother and two Saudis travelling on diplomatic passports. He had not packed and his phone and wallet were left in his apartment. On that occasion New Zealand officials met the party as they changed planes in Hong Kong. According to lawyer Roger Chambers, the officials asked the convert if he was returning to Saudi Arabia voluntarily. When he replied he was, the officials let the party proceed. Sometime later this convert managed to contact friends in Auckland to report that he had been tortured and threatened with beheading. * the Spirit of God will work powerfully to protect and preserve every Christian prisoner in Saudi Arabia; may they 'rest' in their Lord and experience his promised presence; may the Lord become their 'sanctuary' (promise from Isaiah 8:11-14) and may they soon be released. A repressive, fundamentalist (Wahhabi) Islamic State, Saudi Arabia does not permit religious freedom for Saudis, for expatriate workers, nor even exiles. Whilst Western expatriate workers worship in chapels inside embassies, impoverished and abused Christian labourers from Asia and Africa have nowhere to meet except in private homes (though such meetings are illegal). On 5 September, Saudi religious police raided a house fellowship in Eastern Province, arresting 27 mostly Asian believers. Their situation in prison is perilous. Not even exiles have freedom. When Khalid Alzahrani (42) disappeared in the company of two Arab men on 31 July, he became the second Saudi Christian to be forcibly repatriated to Saudi Arabia from New Zealand in the last 16 months. Please pray for Saudi Christians and Western states who can advocate for them. Lebanon hosts more than 1.5 million Syrian refugees. Though most are Sunnis (many of whom support the rebel cause) quite a number are Christians. On 5 June 2013 the situation in Syria pivoted dramatically when the Syrian Arab Army (SAA), supported by fighters from Hezballah (Lebanon), Iraq and Iran, liberated the strategic city of Al-Qusayr near the border with Lebanon, changing the balance of power on the ground. Subsequently, thousands of rebel fighters retreated into Lebanon where they have become isolated, cut off from the main theatres of jihad. Most have settled into camps for Syrian refugees and at least 1,500 fighters moved into the refugee camps on the barren plains of Arsal just 40km south-west of Al-Qusayr, off the main highway in the hills overlooking the Bekaa Valley. Up to 25,000 Christians live in the Bekaa Valley villages of al-Qaa, al-Fakha and Ras Baalbek. A group calling itself the Ahrar al-Sunnah Brigade -- which has reportedly pledged allegiance to the Islamic State (IS) 'caliph' Abu Bakr al-Baghdadi -- has been threatening to attack churches and Christians, even threatening to 'purge the Islamic emirate of Bekaa'. Tensions are soaring and the fear is palpable. On 2 August 2014, clashes broke out in Arsal between Lebanese security personnel and fighters from al-Nusra and IS after police arrested al-Nusra commander Emad Jumaa. [While IS and al-Nusra (which is allied to the Free Syrian Army) are fighting each other in northern Syria, they are allies (for the moment) in Lebanon.] A truce was brokered on 7 August, but not before some 20 Lebanese soldiers had been killed and 42 Lebanese security personnel -- 22 from the army and 20 from the Internal Security Forces -- had been taken hostage. Under the terms of the truce, the jihadists lost their ground, having to retreat out of Arsal into the barren lands beyond, but retained their captives. They remain inside Lebanon as Syria will not permit them back on Syrian soil. Hezballah has laid siege to the area. In early September the rebels issued their first demand, insisting the Lebanese government release some 400 Islamists being held in Lebanese prisons. To show they were serious they beheaded a soldier -- a Sunni named Ali al-Sayed -- and threatened to behead another should the government fail to comply. Shi'ite clans made it clear that if any Shi'ite were harmed they would retaliate against Syrian refugees. On 4 September the Lebanese government rejected the terrorists' demand so on 6 September the jihadists beheaded another soldier -- Abbas Medlej, a Shi'ite -- while threatening to behead more Shi'ites should Hezballah or its backers harm any Syrian refugee. [Presumably though, al-Nusra and IS would only care only about Sunni refugees.] Shi'ite clans have retaliated by issuing Syrian refugees with written ultimatums to leave Lebanon. 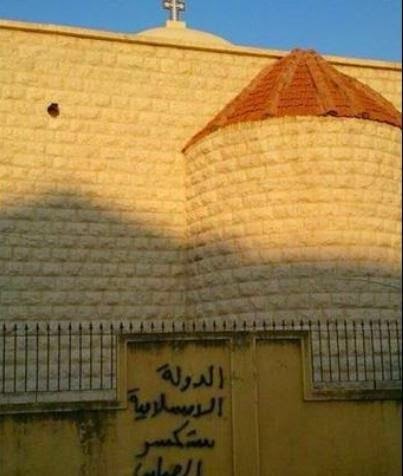 In recent days churches in the northern port city of Tripoli have been marked with Arabic graffiti. Messages have included, 'The Islamic State will break the cross,' and 'We came to slaughter you, you worshippers of the cross.' The Lebanese army has deployed extra forces to the area. * the Lord of grace and peace will grant Lebanon's leaders great wisdom as they seek to tackle the refugee crisis, particularly the threat to national security caused by displaced jihadis. * our heavenly Father will protect, guide and provide for the thousands of Christian refugees from Syria and Iraq now caught up in Lebanon's refugee crisis. Regarding the fact that the enemies of Christ and Israel, i.e. al-Nusra, IS and Hezballah (and their state sponsors) are coming face to face in the region, read 2 Chronicles 20:1-30, where by grace, through faith, the Lord had his enemies destroy one another (v23). In June 2013 the Syrian Arab Army liberated the strategic town of Al-Qusayr, changing the balance of power on the ground. Thousands of jihadis subsequently retreated into the mostly Sunni Syrian refugee camps in Lebanon. Tensions are soaring now as these displaced jihadis launch attacks inside Lebanon. Christians and churches have been threatened in the Sunni stronghold of Tripoli and in the Bekaa Valley. On 6 September Sunni jihadists beheaded a Shi'ite from the Lebanese security forces, causing sectarian tensions to erupt. A new conflict is looming. Lebanese Shi'ites are demanding that Syrian refugees leave Lebanon. This crisis could hit Christian refugees from Syria and Iraq hard -- where can they go? Please pray for Lebanon, for the Lebanese Church and for the Christian refugees caught up in this crisis. 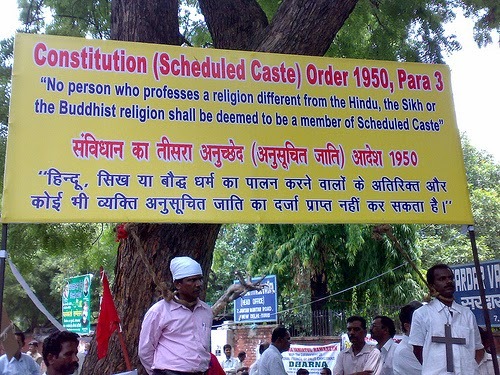 RLPB 270 (23 July 2014) reported that, on the advice of Hindu nationalist (Hindutva) agitators from the Vishva Hindu Parishad (VHP), more than 50 villages in Chhattisgarh's Bastar region had used Section 129 (G) of the Chhattisgarh Panchayat Raj Act to ban all non-Hindu religious practice. This denial of religious liberty has resulted in a sharp rise in persecution, with Christians being assaulted, denied access to food rations and water, and even driven from their villages. John Dayal of the All India Christian Council (AICC) reported on 22 August that, despite concerted advocacy, there has been no response from either the state or federal government. Furthermore, Dayal says that the threat of purging Christians from villages has spread from Chhattisgarh to Madhya Pradesh and Uttar Pradesh. If impunity persists, then so will this trend. Further to this, Hindu nationalists are ramping up their conversion or 'ghar wapsi' (homecoming) campaigns, especially in Uttar Pradesh ahead of by-elections to be held on 13 September. This is nothing other than religious conversion for political gain. On 26 August seventy-two former-Valmikis re-converted to Hinduism after being Christians since 1995. [Valmikis are Dalits ('Untouchables') who venerate the Sanskrit poet Valmiki.] A purification ceremony was held for them inside a Seventh Day Adventist church in Asroi, in Aligarh district. [Aligarh city is just 140 km south-east of New Delhi.] Hindu nationalists had seized the church the night before, removing its cross and installing a portrait of the Hindu deity Shiva. While the re-conversion ceremony naturally upset local Christians, the seizure of the church and its conversion into a Hindu temple sent tensions soaring. To ease tensions, the district administration stepped in and removed the Shiva poster to 'a safe place', and the church's belongings -- i.e. 'a cupboard, Christmas-lights and a single copy of the Bible' -- 'to a locker'. By 30 August eleven Hindu fundamentalists from various Hindutva groups had been arrested on charges of desecrating a Christian church. When Hindus attempted to seize a church in the village of Hasayan in neighbouring Hathras district on 28 August, police stepped in to prevent it. Unable to seize the church (belonging to the Church of North India [CNI]) the Hindus conducted the ghar wapsi in a private residence, restoring 15 Christians to the Hindu fold. A local Hindu nationalist leader, Rajeshwar Singh, said the Dharam Jagran Vivad (DJV) was planning to hold a major ghar wapsi event on Christmas Day. 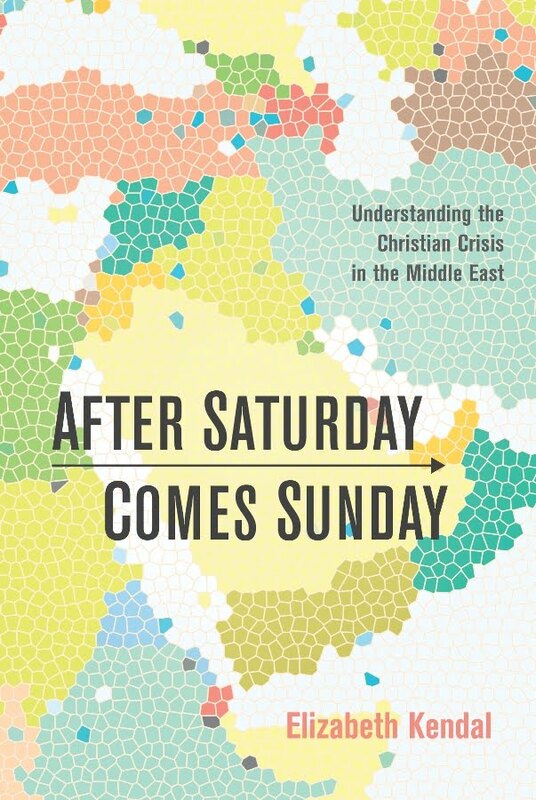 'It will be a big event,' he said, 'targeting almost 1000 Christians.' Another DJV member, Khem Chandra, commented that while the church building 'belongs to the missionaries ... the ground on which it stands belongs to Hindustan. We will not compromise on our dharti (earth).' The DJV intends to erect a temple on the site. Whilst many re-conversions are forced, even violent, many are not. In India, when a Dalit converts to Christianity they lose their Scheduled Caste (SC) status, along with the government benefits and affirmative action the SC status affords. Consequently, many Dalit Christians (and Muslims) are condemned to crippling poverty. For though the government no longer views the Christians as Dalits, everyone else does because caste is deeply ingrained in India's Hindu culture. Accordingly the systematic discrimination continues but without the government compensation. If the convert fails to grow in faith as a disciple of Jesus Christ, or if they feel the Church has let them down -- maybe by abandoning them to their poverty -- the economic benefits of re-conversion can be very alluring. * raise up and powerfully equip Christian strategists who will know how to help India's seriously disadvantaged Dalit Christians. * awaken and sharpen the consciences of all those (local and international) who have influence in India such as diplomats, ambassadors, politicians, journalists, educators and celebrities, as well as those who are leaders in business and industry; may they speak out against inequity and speak up for the voiceless poor and needy (Proverbs 31:8-9); may he magnify their voices and bring cultural change to India. * challenge the 21st Century Church about its market-mindset that pursues measurable 'results' for the purpose of attracting donors; may she instead appreciate the more important long-term daily 'plod' of simple obedience and faithful service that moves beyond conversions to fostering discipleship and facilitating endurance. * send out more workers throughout the enormous and needy mission field that is India. On 26 August seventy-two Dalit ('Untouchable') Christians in Uttar Pradesh were re-converted to Hinduism inside an SDA church in Asroi that had been seized and turned into a Hindu Temple. The police have stepped in to ease sectarian tensions. On 28 August police prevented Hindu nationalists seizing a church in nearby Hasayan. The ceremony of re-conversion of 15 Christians into Hinduism then had to take place in a private home. The government gives the Dalits benefits and affirmative action to alleviate their poverty, but when they convert to Christianity the benefits stop. Discrimination against them as Dalits continues, only without the benefits. The missionaries of Hindutva are exploiting this to lure desperately poor Dalit Christians back into the Hindu fold. Please pray for India and for the Indian Church.